Here is some interesting Sarah Palin-related news that doesn't involve her opening her mouth and complaining about what someone said about her or her latest analytical gem she would deliver on Fox News. Sarah Palin will be speaking on June 11, 2012 at the International Dairy-Deli-Bakery Association's (IDDBA) Dairy-Deli-Bake convention at an event titled "The Heart of a Rogue Trailblazer." In 2006, Sarah Palin became the youngest person and the first female to be elected as governor of Alaska. A short two years later, she was tapped to be the vice-presidential running mate for Senator John McCain. She was the first Alaskan on the national ticket and the first Republican woman nominated for the vice-presidency. She has since endorsed and campaigned for the Tea Party movement. She is a contributor to FOX news where she offers political commentary and analysis and participates in special event political programming. She’s the author of Going Rogue: An American Life and America by Heart. She was named to Time magazine’s 2010 “100 Most Influential People” list. Known for the meteoric rise that captured the hearts and minds of a global audience, Palin is a groundbreaker who speaks on her vision for energy independence, national security, fiscal responsibility, health care, and small government. Why is this interesting? Because the event billed as a "must-attend" event for retailers, manufactures, and industry professionals is inviting a woman who failed to listen to industry professionals and used her political position to fire them and appoint a bunch of cronies to a government oversight board helping funnel money from Alaskan taxpayers and the U.S. Treasury to her friends and their businesses. That's right. If you haven't heard of it before it is because the events occurred before she became John McCain's titanic pick to be the vice-presidential nominee and as we had seen with that, there was very little research done by the media (or anyone apart from a few dedicated journalists and bloggers) that highlighted Palin's not-so-lustrous career as an Alaskan politician. In the summer of 2007, Matanuska Maid, the 70-year-old dairy the state had taken over in the 1980’s, was probably beyond saving. The rising cost of milk, and price competition from national brands, made it unlikely the struggling dairy would ever make its way back to profitability. Alaskans are practical, independent and a little sentimental. The Matanuska Maid logo was a treasured icon in southern Alaska. As one of the few buyers of local milk, its closing would have ripple effects throughout the local agricultural community. But giving out precious tax dollars so a few well-connected dairy farmers could make products most Alaskans couldn’t afford to buy didn’t make much sense to the Creamery Board, the Board of Agriculture and Conservation(BAC) subcommittee that had direct oversight of the state-owned company. So they refused a $600,000 state grant to keep Mat Maid going, and did what they felt they had to do as responsible overseers: put the troubled dairy out of its red-ink-drenched misery. Palin was outraged at this callous disregard for the well-being of local farmers, and insisted the dairy simply needed to be properly managed. Radical measures clearly needed to be taken. Palin fired the whole BAC. The new Board Palin appointed quickly designated itself as the new Creamery Board. This group of local notables was much more likely to keep Mat Maid alive: it was composed solely of relatives and associates of the dairy farmers most likely to benefit from continued milk purchases by Mat Maid. But the farmers’ political connections went even deeper: Franci Havermeier, Director of the Division of Agriculture, was the real estate agent for BAC/Creamery Board chair Kristen Cole. This connection was apparently sufficient to qualify Havermeier, a housewife, as Director over a well recognized agriculture industry expert and a UAF Professor with a degree in agricultural economics. Franci’s father in law, Bob Havermeier, was one of the dairy farmers to benefit from the continued payouts by Mat Maid. We shouldn’t be surprised that Havermeier was as unqualified as she was well-connected. None of Palin’s appointees to the BAC had any actual expertise in the dairy field, either, just family or business ties. 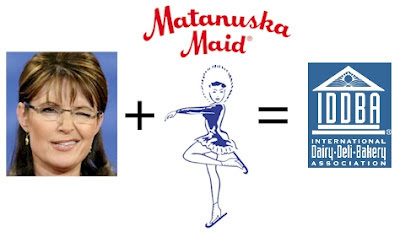 Once the new Board was seated and the death sentence on Mat Maid lifted, Palin immediately authorized paying out the $600,000 state grant to Mat Maid. The money disappeared into the corporation’s general funds, where it was used to fund operations. Payments to the well-connected dairy farmers continued uninterrupted, even as other bills piled up. In my last post I mentioned how raising the price of milk Mat Maid paid to dairy farmers only made Mat Maid’s economic predicament worse. The Creamery Board’s lack of experience running a dairy might explain such a violation of basic business sense, if it weren’t for the fact that the beneficiaries of the continued payments were the Board’s own friends and relatives. By ignoring the taxpayers’ interests and putting her own people in place, Palin was able to keep state funds flowing to thefavored few in her hometown of Wasilla and nearby Palmer. Of course, this naked money grab needed camouflaging. So the new Board spent several months, and tens of thousand of dollars, investigating the prior Board’s behavior, hiring an accounting firm (Mikunda, Cottrell and Company) to review the financial records of Mat Maid and look for the classic mismanagement trinity: waste, fraud and abuse. No significant improprieties were found. I'm a little worried about the way the Governor is handling this Mat Maid thing . I still have a lot of faith in her and her ideas. But I believe that maybe she isn't getting the whole picture on this dairy business. Dairy nation wide has been supported by government for many decades. Now with the ethanol growth the price of feed is going to put a squeeze on even the best run dairy ' s in lower 48. Joe Van Treeck is a very capable and honorable man. He has already done miracles keeping Mat Maid operating for last 25 years .. He took a lot of heat early on by importing milk to keep production up. Through out the years he has introduce many innovative products to keep the dairy diversified. I do believe that if Joe Van Treeck can ' t keep Mat Maid going then no one can. My point is I don ' t want to see Sarah get into something which will backfire and haunt her for the rest of her administration . Although she is quite committed publicly almost Frank like . I do not believe that the dairy can once again operate without lots of government dollars. If she goes and puts 2-3 million dollars into to save livelihood of 4 or 5 farmers it will not set very well with a lot of people in the state. Also by axing board members that aren ' t yes men she puts other state directors into the position of maybe not being quite candid enough so as not to lose their jobs . I don ' t really believe in the my way or highway approach when you are dealing with knowledgeable people . You end up with too many yes men and too many failed projects. This guy has sent me a couple of notes in the last two weeks-he obviously likes JVT , but I am concerned about the line about helping 5 farmers . We need to make sure our message today includes the destanilizing effect the elimination of the dairy segment will have on the overall agricultural industry ... not to mention the 100+ jobs at the creamery. Not to be one-sided, here is Palin's take on the issue by looking at a2007 email conversation with her chief-of-staff, Mike Tibbles, as well as others. communicating with him for over two hrs trying to track him down - this was amazing. need to get to the bottom of the issue here. Bottom line - he submitted a letter of resignation that the bd still hasn't accepted. Mat Maid' s management appears to have run the business in the ground without fair notification given the entity's owner (the state). we stuck our neck out asking legislators for the funds to keep this running while a plan was put in place - as requested by MatMaid - then they ripped that opportunity out from under us, the farmers, all Alaskans, and he decides to resign before the closure "emergency". I need an investigation of this entity' s management asap because this is a cluster and certainly there's got to be a consideration of malfeasance on someone ' s part here. Businesses don't just go belly-up overnight. Farmers are holding their breath, counting on us to help . MatMaid dumped a nuclear situation on our lap. Does the board have attorneys working for members and VanTryck - protecting them and their information - from the AG ' s office or the private sector? I hear they do have attorneys from somewhere on board. Upset for not getting a tour, Tibbles starts spouting off rumor after rumor - water bottling aspirations, golden parachutes, and attorneys at work. replacing the board asap. As soon as I know the proper steps to do so via Tibbles and Ivy. Msg also has to include: "the creamery bd voted to close MM, hence their work is done and they'll not have any task in front of them anymore..." (Is this accurate? Wasn't their entire mission to operate the now defunct MM?) "...hence the need for a new bd with new focus..."
Palin's view was that the BAC was no longer relevant because they were supposed to ignore any and all financial problems and cut endless checks from the state to keep her friends back home satisfied. Essentially, everything Red Secoy predicted came true, but the ever-delusional Palin still saw things differently. Here is what she said when she resigned from being governor: "We took government out of the dairy business and put it back into private-sector hands - where it should be." Didn't Palin try to do everything to keep government in the dairy business? This is all very interesting because now Palin, the woman who ignored the advice of industry professionals is giving a speech to industry professionals. What do you think about that? Is Palin a trailblazer or just another corrupt politician who is now profiting off her career in government? Tweeted and link-back today. Thanks for the summary, Kevin. Alaska blogger and businessman Andrew Halcro (who ran against Palin in the Republican primary for governor in 2006) has also followed the Palin administration's fraudulent involvement in Dairygate. I came across some of his stuff when researching this post. I was really unfamiliar with this scandal but after reading about the IDDBA speech I thought it was worth another look - especially if some trade group was paying Palin to speak. After reading about the details alarms went off in my head. There were so many things that just didn't seem right and it bothers me that the media seemed to have ignored this story, as well as many others, from Palin's past. Now we are stuck with the celebutante and her uneducated brood making money off of America's lust for the inane.